This book offers a concise introduction to mathematical inequalities for graduate students and researchers in the fields of engineering and applied mathematics. It begins by reviewing essential facts from algebra and calculus and proceeds with a presentation of the central inequalities of applied analysis, illustrating a wide variety of practical applications. The text provides a gentle introduction to abstract spaces, such as metric, normed and inner product spaces. 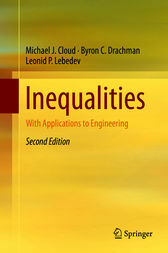 It also provides full coverage of the central inequalities of applied analysis, such as Young's inequality, the inequality of the means, Hölder's inequality, Minkowski's inequality, the Cauchy–Schwarz inequality, Chebyshev's inequality, Jensen's inequality and the triangle inequality. The second edition features extended coverage of applications, including continuum mechanics and interval analysis. It also includes many additional examples and exercises with hints and full solutions that may appeal to upper-level undergraduate and graduate students, as well as researchers in engineering, mathematics, physics, chemistry or any other quantitative science. Michael J. Cloud received a Ph.D. in Electrical Engineering from Michigan State University. He has been a faculty member in the Department of Electrical and Computer Engineering at Lawrence Technological University since 1987 and currently holds the rank of Associate Professor. Byron C. Drachman is Emeritus Professor of Mathematics at Michigan State University. He received a Ph.D. in Mathematics from Brown University in 1966. Leonid P. Lebedev completed a Ph.D. in Physics and Mathematics at Southern Federal University in Russia. He is a professor of mathematics at the National University of Colombia at Bogota and holds a faculty appointment at Southern Federal University.